When I was still a greenhorn gardener, I was taught—and have since always believed—that one should “feed your soil, not your plants”. But what if you have no soil? This is exactly what crossed my mind in November 2008, sitting in the San Francisco Public Library, reading a somewhat dated issue of National Geographic Magazine. The issue’s focus was soil and inside was a short piece about Haiti. I read about Haiti’s tumultuous history, the centuries of colonialism that lead to degradation of both the people and the land. I read about a young ecologist named Sasha Kramer who had co-founded an organization dedicated to alleviating the suffering of Haiti’s people and rebuilding its soil. Sasha Kramer co-founded SOIL (Sustainable Organic Integrated Livelihoods) in the northern city of Cap-Haitien, Haiti in the summer of 2006, just months after finishing her PhD at Stanford University. During her last two years of graduate school, Sasha visited Haiti ten times – her advisors were worried. But five years later, Sasha’s patent determination and indelible passion have firmly established SOIL’s commitment to protecting soil resources and empowering communities. The organization is thriving and the National Geographic Society recently named Sasha as one of their 2011 Emerging Explorers. Prior to the earthquake on January 12, 2010 only 17% of Haiti’s nine million people had access to improved sanitation. Most people are forced to find other ways to dispose of their wastes, often in the ocean, rivers, ravines, plastic bags or abandoned houses. Besides lacking the dignity that suitable sanitation provides, there is a high risk for diarrhea and other water-borne diseases when adequate sanitation is unavailable to so many. At the same time, Haiti’s agricultural output is low, due, in part, to poor soil fertility, soil erosion and lack of affordable fertilizers. When I first read about SOIL, I was teaching composting and gardening to children and adults in California. National Geographic described SOIL as “a nonprofit group that builds composting toilets in rural communities to get much needed organic matter and fertility back into fields”. “Brilliant!”, I thought, and after leaving the library I all but sprinted home with soil, and SOIL and Haiti buzzing in my mind. I wrote to Sasha and less than five weeks later, I landed in Cap-Haitien, for the first time. It was a short trip, but I had managed to raise money for the organization before leaving the US and maintained a blog documenting the experience. When the earthquake hit, I got the news in my San Francisco apartment just twenty minutes after the first shock. I was overcome with grief. I had stayed in close touch with Sasha since my visit a year before. I wanted so badly to be there, to help. But what could I do? I didn’t speak Kreyòl and worm bins and bean sprouts were not what Haiti needed immediately following this devastating disaster. So I waited. I began working with a Farm to School program where I taught urban elementary aged children where their food came from (or where it should come from). I loved it, but my heart was with Haiti. Every bit of news from Sasha was welcome, however tragic the details. When Sasha emailed me in November 2010 asking if I’d like to come to Haiti and work for SOIL full-time – I did not hesitate. I turned down a recent invitation to the University of California-Santa Cruz’s Agroecology Farm Apprenticeship Program and bought a one-way ticket to Port-au-Prince. 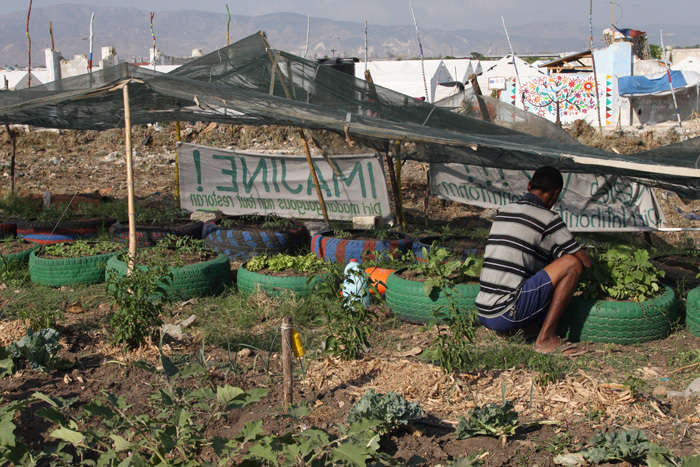 SOIL was working in rural communities and urban slums in northern Haiti prior to the 2010 earthquake. In SOIL’s formative years, they built a handful of permanent dry composting toilets. 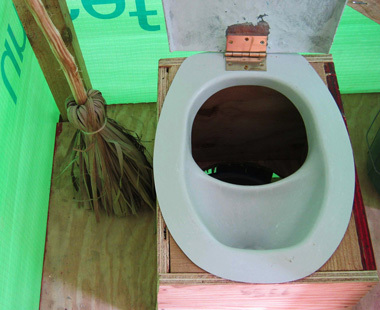 After the earthquake, Oxfam Great Britain approached Sasha and asked her to build 100 emergency Ecological Sanitation toilets in Port-au-Prince. Initially Sasha said no, “SOIL doesn’t do emergency work, we are a development organization”. But Oxfam GB pursued and Sasha relented. When I arrived one year after the earthquake (and two years after my first visit), the SOIL team was still moving at emergency speed. SOIL had built 200 toilets in Port-au-Prince in 2010, all in IDP (Internally Displaced Persons) camps across the broken city. All were dry composting toilets, also known as urine diversion toilets, in which a special seat separates the urine from the solid waste. The SOIL team collected 15-gallon barrels of poop from over 35 tent camps, amassing almost 5 tons of human waste every week. The waste was (and still is) composted in large closed bins along with a carbon source; as all composters know one must strive for an appropriate carbon to nitrogen ratio. 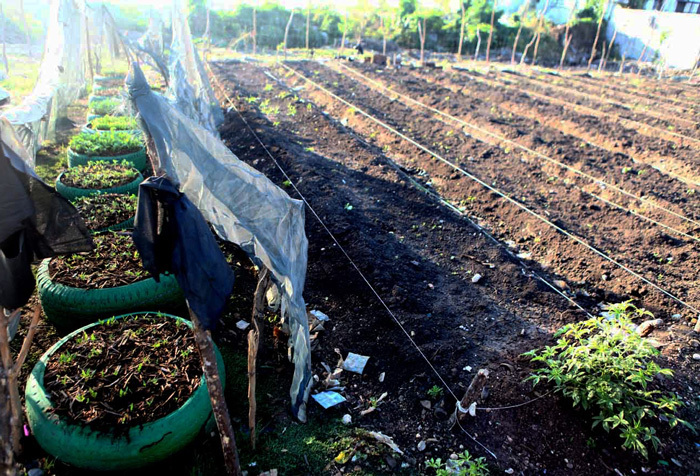 In a matter of months, the result of poop and bagas (a sugar cane by-product of rum manufacturing) yields compost. Black, crumbly and rich, surely as beautiful as anything I’d seen in my own back yard made from banana peels and coffee grounds. The process of composting human waste is, in fact, not so different than composting kitchen and yard scraps. SOIL is careful to watch temperatures, as the only lab in Haiti capable of testing for pathogens was destroyed in the earthquake. But both Haitian and international academic and government professionals have declared the compost not only safe, but indeed a valuable resource and one badly needed in Haiti. SOIL consistently evaluates and reevaluates its compost, its processes and its programs, and this is something the permaculturist in me recognizes and appreciates. SOIL sells their compost to local farmers and NGOs, both large and small, which have agriculture and reforestation projects across Haiti. The organization also holds regular Ecological Sanitation workshops in English and Kreyòl, leading the charge to spread sustainable sanitation throughout Haiti. SOIL is growing — and by that I don’t mean we are getting bigger, just better, smarter and more experienced. I joined the SOIL team late in this game, but I can say, ten months into 2011, that I am proud to be a part of this organization, to be able to empower communities, build the soil and nourish the grassroots in a country so rich in history and unique in culture. Corinne Coe is Program Manager for SOIL. She lives and works in Port-au-Prince, Haiti but is always thinking of her nephews Cachao and Cello in the U.S. You may contact her at ccoe@oursoil.org and visit SOIL at www.oursoil.org.